Sign lighting serves a functional role by providing illumination to signage, doorways, and walkways after dark. But sign lights can also play an integral part in the design and branding scheme for a company right from the front door. The workhorse of commercial lighting is the Angle Shade Sign Light. In the past, these simple gooseneck lights were galvanized or basic black, and their job was to highlight a sign, awning, or entryway. Business owners are finding out, however, something that savvy interior designers have known for a long time. 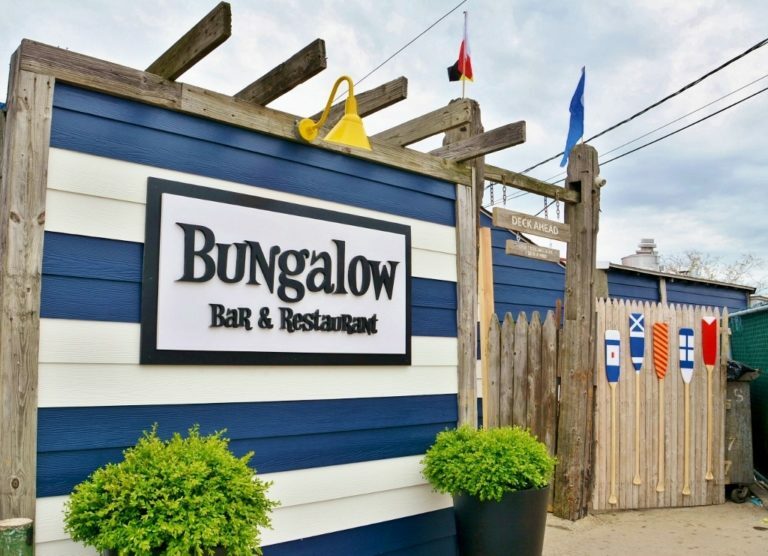 These sign lights can provide a wow factor to exteriors and should be thoughtfully considered as an important element of the overall look. This Frontier Angle Shade is an easy-to-customize light available in four shade sizes from 8″ to 14″ and a range of powder coat and natural finishes designed to withstand the elements. Options range from different gooseneck arm styles to extra touches like a wire cage or cast guard and glass. An optional swivel knuckle allows exact positioning of the shade while a dusk-to-dawn photocell turns the fixture on automatically at dusk and off again at dawn. 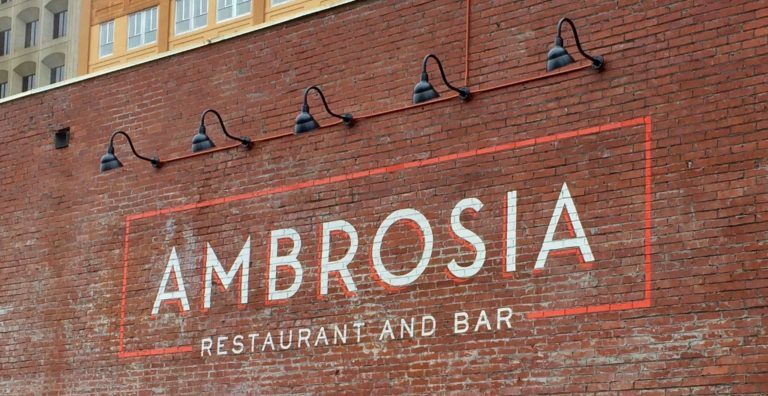 This brick wall and its 21-foot sign extend half a city block so finding the right scale for lighting was tricky. The business owner opted for five Emblem Sign Lights which feature a more rounded shade than the Frontier. These American-made wall lights were customized with a 10″ shade, Black finish, and G22 gooseneck arm in a matching Black finish. 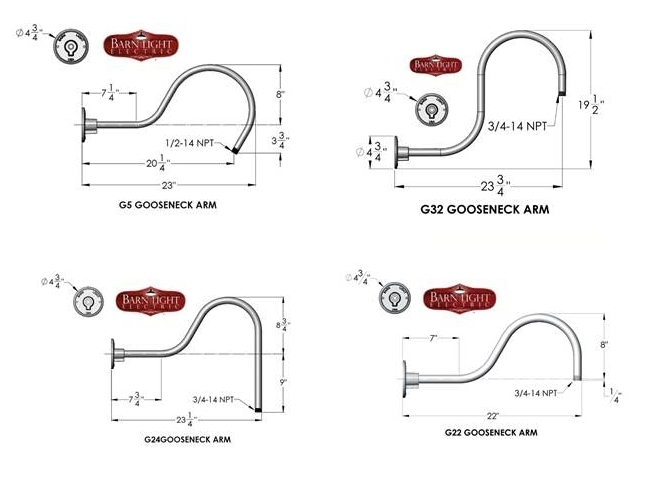 Speaking of gooseneck arms, once you find the perfect shade, it’s important to choose the right gooseneck arm for the space. Gooseneck arms come in dozens of sizes and shapes so you can project your light at the best angle away from the mounting surface. The above is a sampling of the different styles that are available. Custom arms can also be crafted when necessary. 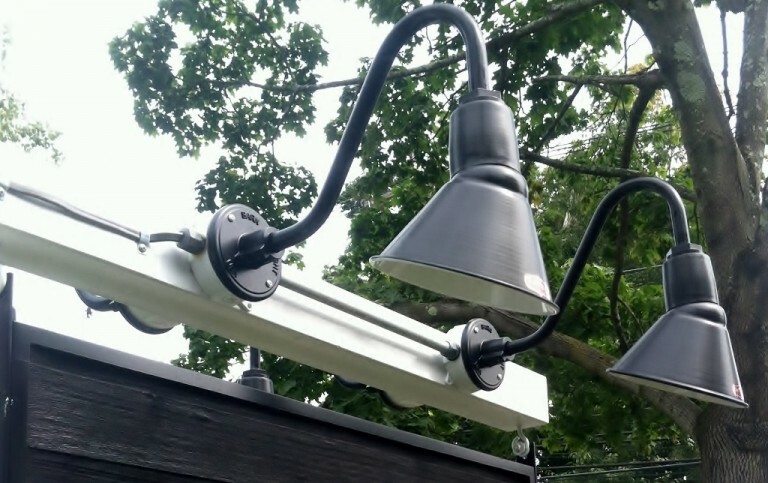 For large commercial jobs, Barn Light Electric’s Commercial Division assists designers, architects, and other professionals in specifying stylish, high-performance sign lights and other fixtures for businesses across the United States and Canada. 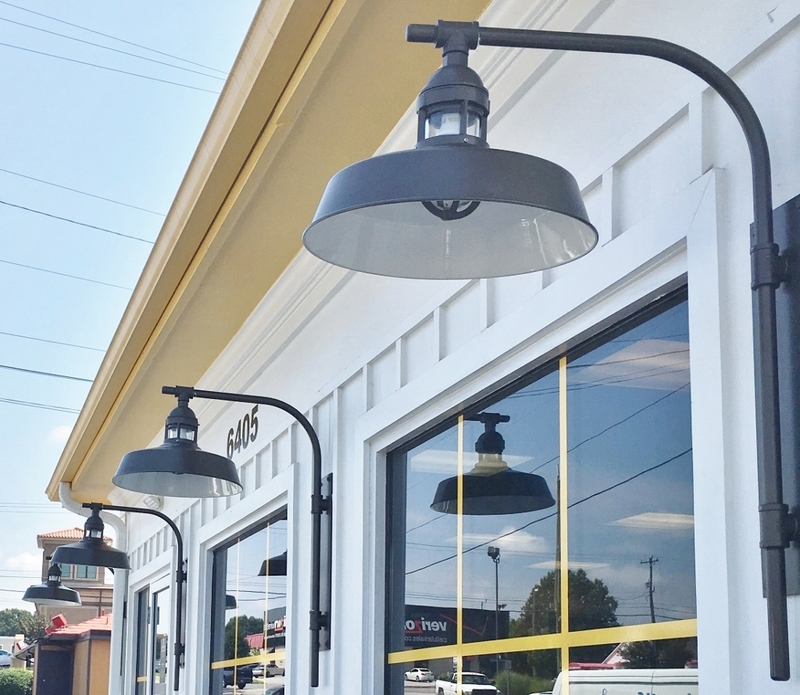 This North Carolina restaurant features Barn Light fixtures inside and out including these modified Sydney Gooseneck Lights. For questions on sign lights or other commercial lighting, our sales team can be reached at 800-407-8784, via email at sales@barnlight.com or via Live Chat from our home page during regular business hours.